I do apologise for the photo, I will have to find a better place to take photos, but for now I am sure you can see it well enough to get the idea. I have used the Hostess Stamp Set “Silhouette Sentiments” and my favourite marker technique to ink up the stamps. The colours I have used are Poppy Parade, Wild Wasabi, Pumpkin Pie, Regal Rose and Rose Red. The ribbon was supposed to be in Pumpkin Pie but I didn’t have any so used some of the Peach Parfait Stitched Poly Ribbon instead. And if you look closely you will see a little of my favourite paper piercing just along the top. I would also like to say a very quick thank you to the lovely Kerri Donsky. Your message made me realise that there are some people out there who are thinking of me, so thank you. 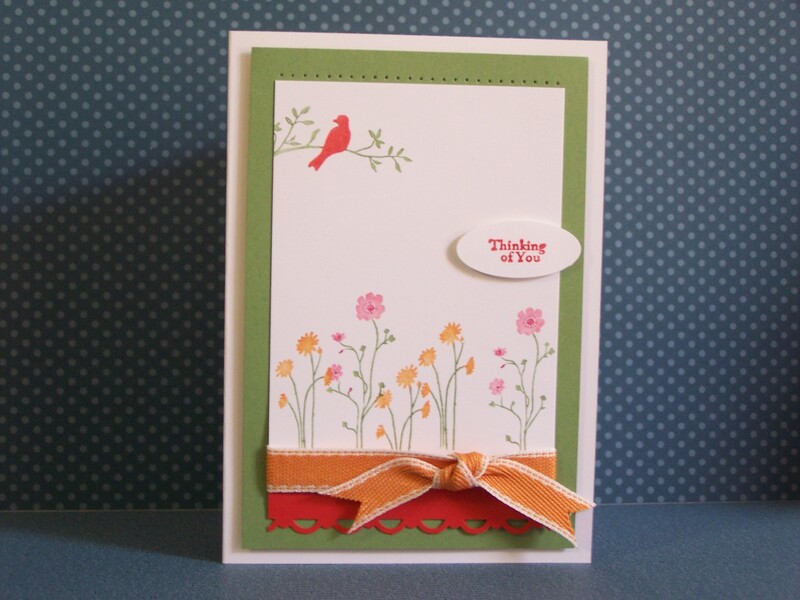 It was you who inspired to do some stamping again. If any of you are trying to contact me, the best way is by email at chrisjparkerbarnes@gmail.com I am still currently a demonstrator for Stampin’ Up! so am able to take your orders from anywhere in Australia, so feel free to contact me. Thanks for stopping by, and hopefully I will be inspired to do some more stamping to share with you soon. Images copyright 1990 -2011 Stampin’ Up!